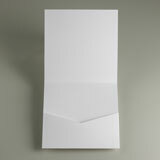 Envelopments® can be purchased per piece for your own do-it-yourself announcements or Cherish Paperie can custom design the perfect piece for your event. Contact us for more information. 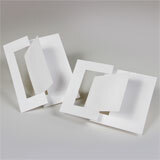 Visit our Design Gallery for ideas. See our sizes, colors or FAQ's or ordering page for product information. 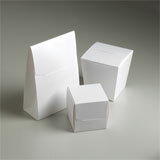 New for 2008 - all Envelopments® products must be ordered in quanities of 10. Visit our Frequently Asked Questions Page for all the answers! Click here to see our overstock items! 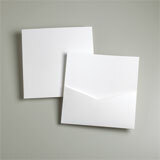 Envelopments® can be put together in a number of ways. 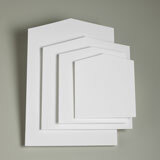 Items can be laid in, or you can mount them with a variety of glues and tapes. We highly recommend pressure sensitive transfer tape. 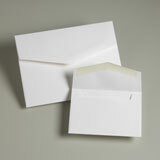 this is a double-sided tape that can be used for mounting and sealing your Envelopments® closed. Recommended as the best tool and tape for assembly, the ATG gun dispenses a fast and accurate thin film of double sided pressure sensitive tape. GlueDots for assembly of layers and sticking on embellishments. 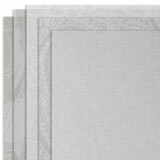 Mini and Memory Glue Dots are very thin double-sided adhesive dots on a roll. 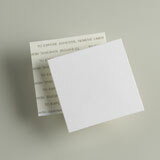 Pop-up Glue dots are thicker dots for achieving a three dimensional look. Remember to check for extra postage due to odd sizes and weights. You may also ask at your local post office that your Envelopments® be hand canceled if they incorporate delicate material inside (like sealing wax or dried flowers). 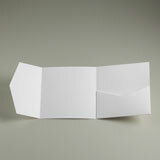 Envelopments® can be sent inside an outer envelope or used as a self-mailer. 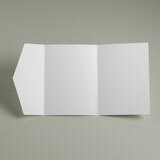 If used as a self mailer you will need to seal them so as not to open in transit. 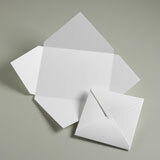 Use the Envelopments® 2x2 Sealing Squares or make sure you a using a high tack sticker for sealing. 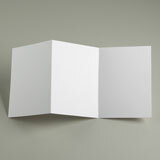 To order invitations, help organize your information, download our Request an Estimate or Place an Invitation Order forms. 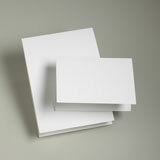 Custom cutting enables access to any size card stock, translucents, papers, and tissues. 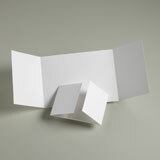 Specify actual dimensions on your order and indicate "custom cutting" if not a standard Envelopments® size. 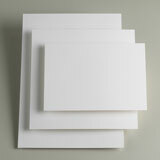 Custom scoring is available to achieve designs spefic to you needs. Please call for quotes on multiple scores (more than 2). 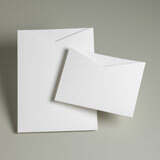 Custom details for Envelopments® can be ordered to enhance the look and functionality. Custom stock, scoring and details all have a standard turn-around of 7-10 business days for production. 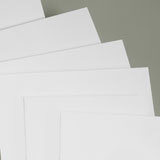 All custom products, such as cutting, drilling and scoring of any of the Envelopments product line must be paid in advance to begin processing. No refunds are made for cancelled orders. Refunds will be issued for defective products only. Mistakes overlooked by the client does not deem the product defective. Most orders are drop shipped from our Southern Californa warehouse within 2-5 days of placing your order using FedEx only. Delivery times for Ground shipping vary by location. 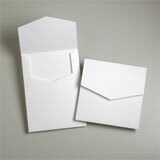 For Envelopments® orders that total less then $100 a service charge of $5 will be added to shipping costs. Sorry but we are no longer able to ship to international destinations. 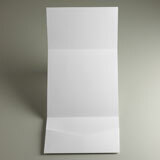 New for 2008 - all Envelopments® products must be ordered in quantities of 10.
please contact us if you need an expedited order by a particular date. 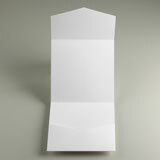 Printed orders take 4 - 6 weeks to process unless otherwise stated. All sales are final. No refunds or exchanges on custom cut items. 20% restocking fee applies to any return or exchange that is accepted. Processing of an order begins once payment has cleared. For most orders, processing time takes 2-5 business days, but can take up to 7-business days. Allow 7-10 business days for orders containing any Group C4, Group C5, or custom items. Most orders are drop shipped from our Southern California warehouse using FedEx only. Ground, 3rd Day Saver, 2-day and Overnight delivery are available (turnaround time as listed above applies to all non-overnight orders). OVERNIGHT and Rush ORDERS: Orders for overnight delivery must be paid for by 10:00am PST to ship same day. Contact us for availability before placing an overnight order. We accept Visa, Mastercard, Discover and American Express over the phone and online. PayPal and checks or money orders also accepted.